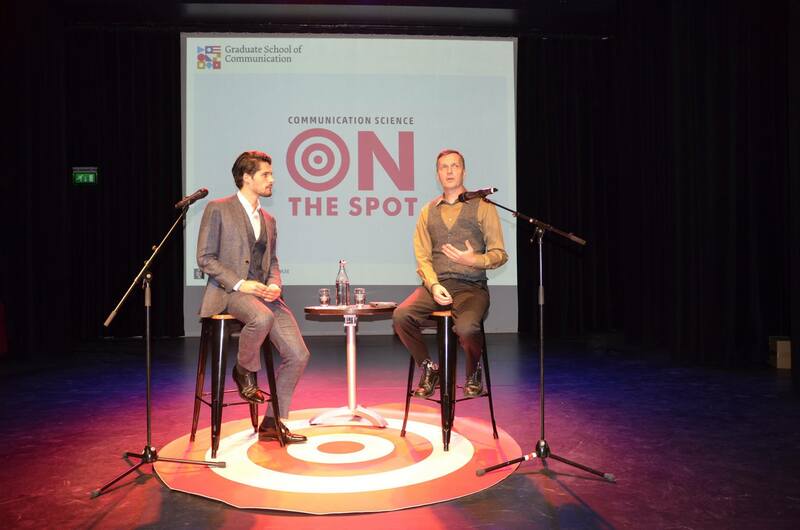 Five times a year, the Graduate School of Communication hosts events called Communication Science on the Spot. During these sessions, a communication professional is interviewed by a Graduate School lecturer. Last week we had the pleasure to welcome Timothy Coombs – author of one of the most influential theories in the field, Situational Crisis Communication Theory (SCCT). He discussed the current issues in the academic and practical sphere of crisis communications. The discussion was moderated by assistant professor Toni van der Meer. Professor Coombs started by explaining what defines an organizational crisis. An organization which is threatened with disruption or is in a state of disruption and has violated the expectations of the shareholders is in crisis. Another important aspect are the potential negative consequences for the organization. If these conditions are not fulfilled then the organization is probably dealing with a “tricky situation” and there is no need to engage in the conversation because it can actually intensify the matters. During the first part of the conversation were discussed issues related to the research of crisis communication. Although no crisis is the same, according to Coombs scientists and practitioners can find common patterns and theory can guide them because 80% of the crises are comparable. This is also part of the strategic way of thinking because in these situations you cannot trust your instinct and need to base your actions on some solid empirical evidence. As perception of the crisis increases among stakeholders, an organization needs to create a suitable response. This is also part of the SCCT which states that if the organization has high responsibility and it is a cause for the crisis then it should employ a high responsibility response in which it apologies and shows concern for the eventual victims. Coombs also discussed the denial strategy. Denial works only if denying responsibility is legitimate and stakeholders believe you. It can worsen the situation if the organization denies responsibility and afterwards is found guilty. If the organization is responsible for the crisis it is a better idea to admit it – people will get over it faster and companies can rebound from that. Professor Coombs shared some practical advices for practitioners dealing with crises. One of the most influential factors during a crisis nowadays is social media. It can serve as a vehicle for spreading negative information, so crisis communicators need to be part of the conversation to manage the damage. But they also need to evaluate whether to do it publicly or with private messages. When people complain online about simple problems or lack of information, you can resolve that publicly and it might lead to reputational gain. When the problem is serious you need to discuss it privately or you risk being exposed. From his experience as a crisis communication consultant Timothy Coombs explained what a public relations practitioner needs to do to create a working strategy to deal with organizational or reputational crises. First of all, they need to know how the organization functions and what the key areas of its processes are. Then they can create a monitoring plan that integrates all sources of information and analyses it. In this way if the practitioner observes that something in the key areas is happening he/she knows what to expect. Crisis communication plans need to be up to date. That was one of the big mistakes BP made during the crisis in the Gulf of Mexico. As one of the responsible practitioners had actually died before the crisis, the BP crisis plan was not accurate: it involved flora and fauna that does not exist in the damaged area. When you are informing the public you need to be absolutely honest and clear about what is happening, that was something BP ignored. They presented more optimistic prognoses of the crisis instead of acknowledging the information they were receiving from the engineers who were working in the Gulf of Mexico. Another example is Samsung; one of the recent victims of huge organizational crisis. Instead of announcing a product recall they decide to call it an “exchange program” which gives the situation a neutral, harmless sound. At the end, the situation escalated as it started to be a danger for the consumers’ safety and Samsung was compelled to admit that the problem is serious and that they are not really aware how to fix it. The Samsung crisis led to significant market share losses and damaged reputation. The participants of the event were able to ask questions throughout the discussion and after the event they had the chance to have a one-on-one conversation with professor Coombs, during the traditional “borrel” (Dutch for drinks) organized after every Communication Science on the Spot event. Join the next Communication Science on the Spot event on December 6th, when Jessica Piotrowski, associate professor of Youth & Media Entertainment, will interview Maurice Wheeler, founder and strategy partner at interactive experience agency The Little Big Partnership.